The Town of Cornelius is a lovely, growing town with more than 15,000 residents and offers a delightful blend of the old and the new. With more than 520 miles of shoreline, life revolves around Lake Norman and its countless water sports and lake-related activities. 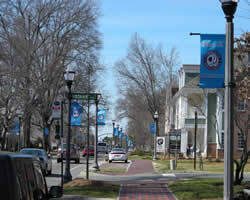 Downtown Cornelius boasts a pedestrian-friendly neighborhood and contains many beautiful, century-aged homes. To learn more about the Town of Cornelius, click here. Cornelius takes its name from Joseph Benjamin Cornelius who founded the first cotton mill in the area. After years of industrial growth, Lake Norman was created by the damming of the Catawba River which led to increased recreational activities and hydroelectric power. This was just as influential to Cornelius as the earlier cotton business. Not only did Lake Norman boost development and growth, it provided the area with an abundance of beautiful lakefront properties. Two popular parks are utilized by the town’s active community. Jetton Park is a 105-acre park with something for just about everyone, from a sunning beach and picnic areas, to tennis courts, biking, and rollerblading trails. Ramsey Creek is a 44-acre waterfront park with a boat launch, fishing pier, horseshoe pit, and volleyball courts among other amenities, as well as a three-acre dog park. Looking for Cornelius homes for sale? Search our local listings database for access to listings in Cornelius and surrounding areas. Whether you want to buy or sell Cornelius real estate, you can browse through properties or find a wide variety of real estate resources available on this website. If you are looking for a Cornelius REALTOR®, choose Debbie Sloan! As your Cornelius real estate agent, Debbie Sloan can assist you with all of your home buying and selling needs. I can provide you with access to the local listings database and offer our experience and knowledge to make the home buying or selling process easier for you and your family. Contact Debbie Sloan today to get your home search started!